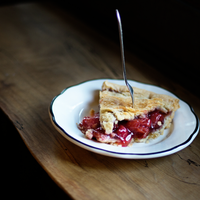 This cozy little pie shop is worthy of a dedicated visit. Grab a slice of delicious pie and a beverage of choice. I got the coconut cream pie, but will definitely be back to try the banana cream pie. A cozy place to grab some sweet or savory pie and watch people walk by. I usually ask the staff for a recommendation on what pie to try-they all look very good and choosing is tough. 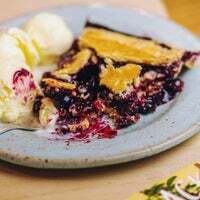 The blueberry pie is flawless. Lemon chess was awesome too.I wish the pecan pie had a more solid nougat-y texture, but was still pretty good. Interesting ice cram favors like goat cheese, or lavender. I'll definitely be going back...often. Coco custard and NY cheese were both phenomenal. Shop has a small window bar with stools...so don't expect seating. Easy to walk and eat to go though. Cute shop. 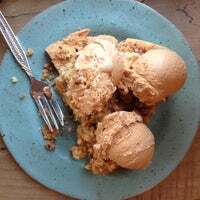 I bought the salty chess pie for my coworkers birthday. It was the best pie I’ve ever eaten in my life. Go around noon (on a weekday) the pies are fresh out of the oven !!!! Petra makes some awesome pies. Trust me, you can't go wrong (that crust is to die for), and you absolutely can eat two slices. Very homey little cafe -- lots of character! Plates and silverware looked like they were off a rummage sale (though clean and without chips). Old wooden counter half-missing. 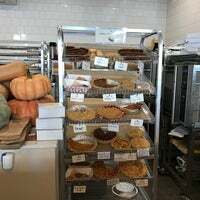 Good selection of pies! 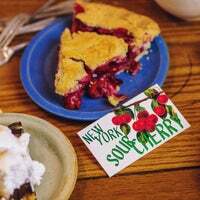 My new favorite pie spot! The lemon chess, almond chess, and sour cherry were great. The crust is perfection, buttery and flakey, and compliments the filling nicely. 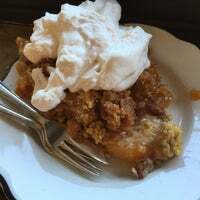 Apple pie with vanilla ice cream was delicious, and my friends loved the sour cherry pie. My only qualm is the limited seating....also I'm not to big on pie. The chocolate ice box pie was amazing, as in I’m going to have to run another 6... or 12 miles because I already want another slice. Very sweet and rich. 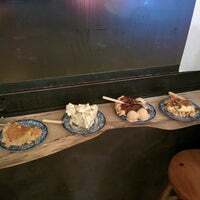 Great sweet pies and the savory pies are enough for a light meal. In case those are out, you could always get the quiche, which is light and fluffy! 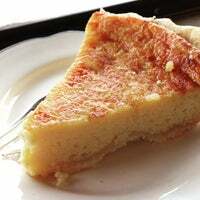 My goodness, this black bottom almond chess pie is AMAZING. Sesame pie is a must if you like tahini, perfectly earthy! I liked the pies, you could really feel the flavours (coconut and almond) but I didn't find them to be outstanding. Oh man that crust is so good! All of the pies are awesome, sweet and savory ones! The cheeseburger bacon pie is so delicious! 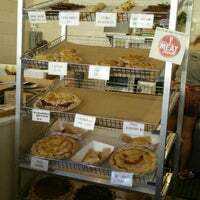 Awesome selection of freshly made pies. Not much in store seating, but a nice, friendly place. I had the chocolate chess pie and it was perfect. 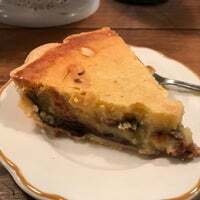 The pecan and chocolate chess pies are delicious. Blueberry isn't bad either. Reasonable prices, too, considering the quality. No time to bake? 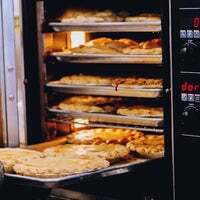 Stroll by Pete’s Pie Company to place your order for a gourmet pie to impress your friends and family with this Thanksgiving. Literally everything is good, but I'm a huge fan of all the chess pies. And the owners are so nice! Might be the best pie I've ever had. Buttery, flaky crust and not too sweet. Tastes like real food! The second you step in, you can't turn back - the sweet aromas! 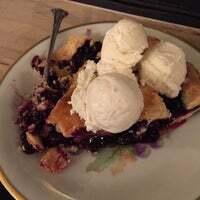 Main blueberry pie is my fave. They get the crust just right. Buttery and flaky, but strong enough to hold the structure of a slice and not crumble too easily. Best place to buy a slice of pie up until 1am. Just walking in, you smile because the smell is amazing. 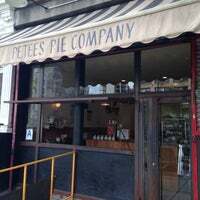 Great pies, look out for their chocolate pecan pie which they only have as a special. A tad pricey but worth every penny. Banana cream pie was phenomenal. Even the crust was delicious. Blueberry, Cherry and Chocolate Chess are my favorites so far. Tiny spot with a small counter. Lemon poppyseed chess pie was delicious. Friendly service. Best pies. Good coffee and tea. Such a great way to end an evening. this spot is ridiculous. gf and vegan options + homemade ice cream to serve a la mode. go. Lemon chess pies are great! 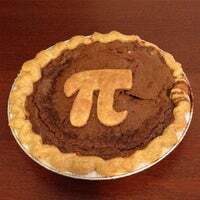 Special pies on pi day! 3.14!! Everything is delicious. All homemade. Open until midnight daily. They also have individual sized savoury pies. Filling include chicken pot pie, empanada and bacon cheeseburger. 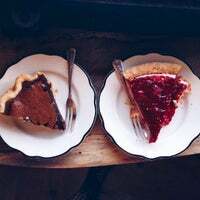 Awesome pies. 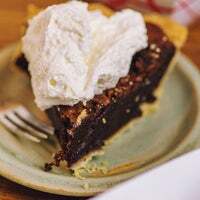 Really enjoy the chocolate chess pie. The crust is what makes this pie special--it's almost like shortbread. "The classic vanilla mille crepe is fantastic!! Next time I'll spring for the lemon or great tea mousse!" "Their Manhattan is one of the best I ever had. Very cozy speakeasy." "Peking duck pancake (sandwich), the Bok Choy, and the sweet and spicy cucumbers. Can't go wrong w any of the dumplings either!" "Great selection of beers. A handful for $5 at happy hour. Food is good too. $2 taco Tuesday. Korean beef tacos were the best."